Five-bedroom Bougainvillea has four grand master suites, world class luxury amenities and enjoys a location that is close to the Club activities yet sufficiently apart on top of its hill. 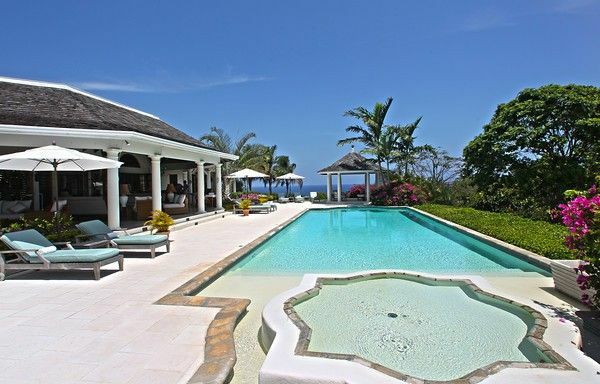 The villa was designed and built in 2008 by one of Jamaica’s best known architects. It is laid out on a single level and demonstrates classic Caribbean Georgian style while including every 21st century luxury. Covering more than 8,000 square feet of indoor living space, the villa occupies a panoramic location along Mahogany Drive with 180 degree sea views. It is a short drive by the villa’s complimentary golf cart to the world renowned Tryall Golf course, private beach, tennis courts, gym, and a host of other of the Club's amenities. Four large and lavish master suites boast spacious private verandas that open to the outdoors, so you can savor your morning coffee or evening Martini and the amazing sea views. Two suites have king size beds and two have optional king or twin size beds. Individual large marble en suite bathrooms have walk in showers and tubs and each en suite also has a private garden shower. The fifth large bedroom is ideal for children or adults with two double beds, a daybed, sleep sofa and its own large, marble finished bathroom. Central to life at the villa is the long veranda that extends over 50 feet from the main house, with ample covered space and luxurious furnishings. The large pool deck bordering the 60 feet swimming pool is fitted with limestone tiles that are cool to the feet. A children’s Wading Pool at one end keeps tiny tots happy and you can keep an eye on them from any of the many seating and lounging areas around the deck. Formal dining indoors or casual dining outside on the veranda is always a celebration. The dining table comfortably seats 12 and sofas provide the perfect place to relax and enjoy the views over the large pool with the backdrop of the sparkling Caribbean Sea. The gracious sitting room or the comfortable family room with flat screen television and home theatre system are perfect for relaxing, or for those seeking quiet contemplation, escape to the library and the villa’s collection of books. There is a telephone line offering free calls to the USA. Bougainvillea House’s real highlight is the charming and experienced staff of five comprising a butler, cook, housekeeper, laundress and gardener.